They are the brave princes of the earth who guard against the wicked and dreadful Anathema-kings of old. They are the thin scarlet line between the most civilized Realm and the barbarians at the gate. They are the shikari-the warriors who form the Wyld Hunt. And this is a story of what happens when duty goes wrong. What happens when the indomitable hunt is hunting the wrong target? When they are ready for one demon-breed but end up against another? And, most important, what happens when the hunters must hunt their own? A story in the Storytelling Adventure System for Exalted. In Hunting A Monster is our latest offering for Exalted in the Storytelling Adventure System. The file contains a number of hyperlinks to various portions of the text as well as bookmarks, so you can always jump right to what you need with just a click. 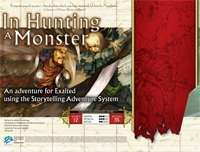 In Hunting A Monster is available at RPGNow.com.